Consider how your firm’s customer experience journey can improve interactions with your brand—particularly during a consumer crisis—and boost the company’s reputation and bottom line. When people experience extreme floods of emotions, they tend to not think or behave rationally. It could be a parent visiting a doctor’s office for a sick child, a person checking their online bank account only to find money missing, or someone getting into a car accident and not knowing exactly what to do next. Scenarios such as these elicit great emotional distress, which in turn, can cause people to make poor, and often irrational, choices that make their experiences even more challenging. When the people in the scenario are customers of a business, these experiences can lead them to negatively perceive the company and its ability to provide a worthwhile experience. So, what can be done? This is where compassion for the customer comes into play as a vital link in the relationship between the brand and the consumer. The framework for understanding compassion, in some respects, lines up with general strategies for transfor-mative customer experiences: research and understand the pain points of the customer journey, design a strategy that leverages feedback from the customer, then develop and implement a plan that addresses your customers’ needs. When you’re considering how to be compassionate in designing CX strategies, you must first notice that the current experience is not meeting your customers’ needs. Even worse, it may be directly or implicitly causing harm. At the beginning of any CX transformation, you must provide an honest and thorough assessment of your customers’ experiences. 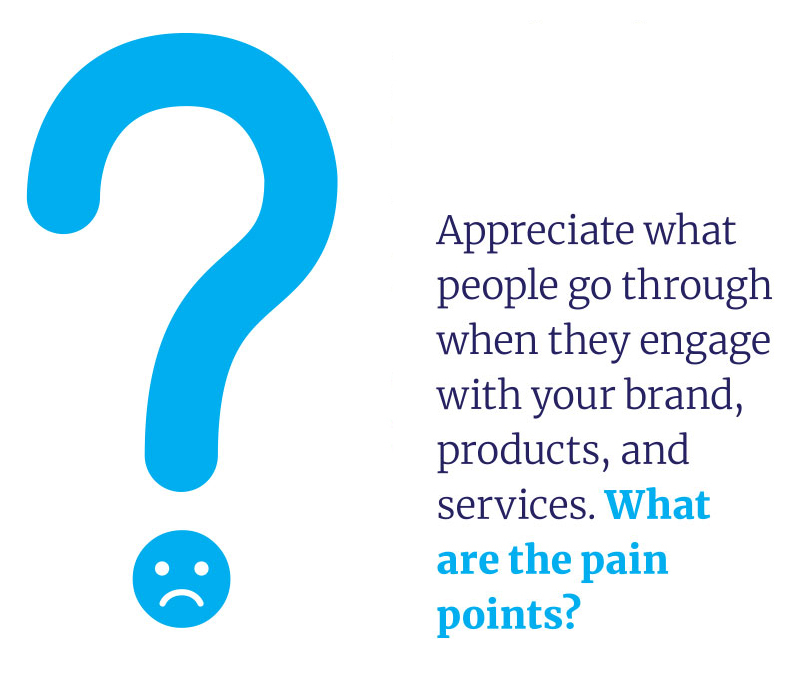 Appreciate what people go through when they engage with your brand, products, and services. What are the pain points? Who are the key players in the process? Is your organization even capable of meeting your customers’ needs? Being compassionate in the design of a customer experience means contending with the possibility that the current customer journey may do more harm than good. Journey mapping and defining customer personas are critical for assessing the current state of your CX program. Moreover, the assessment process creates tangible assets for teams to conceptualize distressing touchpoints, redundant or wasteful activities, and critical moments of truth that shape customers’ long-term company perceptions. When you can see a consolidated view of the challenging touchpoints your customers face, you can begin to recognize their needs and expose gaps in the journey. 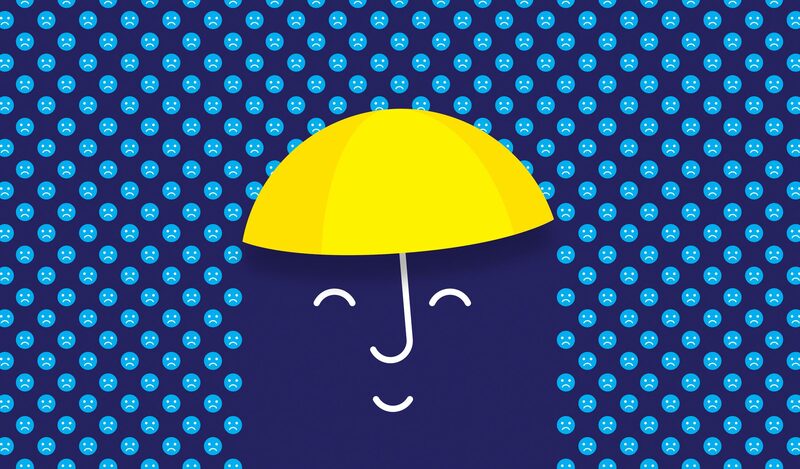 What is it like to be a customer of your brand? Have you been a customer of your company’s product or service? Next, imagine being a customer in the midst of an emergency or major life event. How does that experience change? How does that feel? Of course, the form and magnitude of customer sentiment will change from industry to industry. It’s easy to imagine customers experiencing a crisis while dealing with a health care service provider. The complexities of obtaining and paying for health care services bring a wide array of emotions. However, other equally hair-raising scenarios can elicit emotional distress. They can be as complex as identity theft or a private data leak, or as relatively simple as the theft of a mobile phone. Any of these situations can make a customer’s journey profoundly more difficult, which in turn can leave your customer with negative feelings toward your brand. Recreating the feelings of your customers in order to put yourself in their shoes can be difficult without actually creating an issue for yourself. So, what do you do? How do you learn and begin to empathize with your customers? One of the most powerful resources in customer experience design is the voice of the customer. Voice of the customer (VoC) data is the product of a structured and purposeful approach to capturing customer feedback, requirements, and sentiments around a brand, product, or service.3 It provides an important lens into the perceptions and feelings people have around a subject. That said, VoC data also lends itself well to learning about the emotional effect of current journeys on your customers. This data can direct businesses toward opportunities for improvement. Moreover, the way in which you define and characterize your customer personas can expose nuances of their experiences, and subsequently, their feedback. Are they a “customer,” or a “single parent”? Should they be labeled as a “patient,” or does “cancer survivor” provide more context? If you envision a “patient’s” journey to identify a new health care provider, you will certainly find opportunities for improvement. But if you explore a “cancer survivor’s” similar journey, might you feel something different? Does it expose more pain points in the customer journey? Is your level of empathy deeper? The last component of compassionate CX design is taking deliberate steps toward improving the experience of those in need. What separates empathy from compassion is action—specifically, making purposeful attempts to alleviate a person’s suffering. To that end, take what you have learned, and the empathy you have built for your customers, develop an action plan that satisfies their needs and expectations, then formally execute that plan. Your customers will value the thoughtful and considerate attempt at resolving their problems, and your business will be better off with a more refined CX program. Understandably, proposing a compassionate approach to customer experience may be a turnoff for leadership. It’s not that senior leaders want to be less compassionate; it’s because the value position of compassion may be difficult for some to correlate to higher revenue and an increase in brand value. It’s possible discussing feelings and emotions leads people to think it’s a simple problem of efficiency and lack of service—a quick fix to an issue. Nevertheless, compassion can differentiate your brand in the market, distinguishing it from others. Compassion reveals a lot about our moral and ethical beliefs. It can serve as the foundation of your moral purpose, be the key driver of your company’s culture, or be the means by which you serve your customers. Being compassionate inherently betters people’s lives. Applying a compassionate framework to your organization’s customer experience principles can transform your customers’ journeys, providing profound and deeply impactful experiences in their lives. Jason M. Kanov et al., “Compassion in Organizational Life,” American Behavioral Scientist 47, no. 6 (2004): 808–827. Clara Strauss et al., “What Is Compassion and How Can We Measure It? A Review of Definitions and Measures,” Clinical Psychology Review 47 (July 2016): 15–27, https://doi.org/10.1016/j.cpr.2016.05.004. Abbie Griffin and John R. Hauser, “The Voice of the Customer,” Marketing Science 12, no. 1 (1993): 1–27.